These super-hilarious dubsmash videos will make you laugh hard. 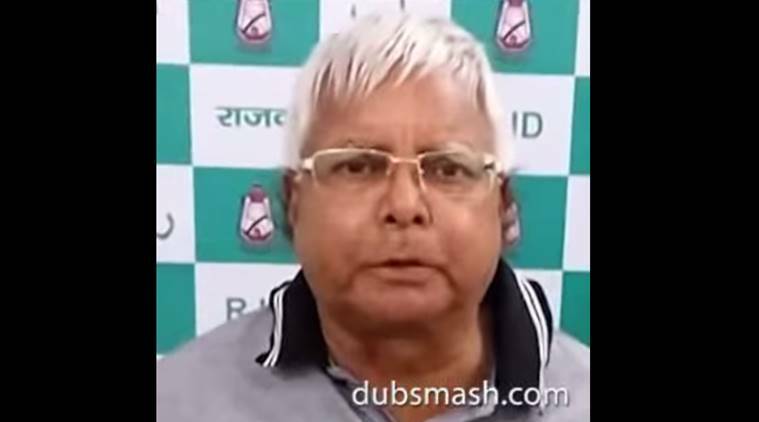 A screengrab of RJD chief Lalu Prasad Yadav’s dubsmash. Dubsmash, a mobile app to create short selfie videos dubbed with famous sounds, has become quite a craze on social media with people posting their videos on all sorts of sharing platforms. Not only the common man is hooked to it, but sportspersons, Bollywood stars, and even politicians are riding onto the Dubsmash bandwagon. Among them, a few have been making quite a sensation on social media. Here is a list of five debut dubsmash videos you shouldn’t miss. Shah Rukh Khan made his debut on Dubsmash with an ode to “Devdas”, which celebrated 13 years recently. He re-iterated a dialogue from the movie, which everyone agrees, is one of the best from the Sanjay Leela Bhansali directorial. Recently, Rashtriya Janata Dal President Lalu Prasad Yadav made his debut on Dubsmash and had the world rolling in laughter. Considered one of the funniest (no offence) politicians India has today, Lalu mimicked Narendra Modi speaking his quintessential lines – “Mere pyare bhaiyon or behenon” and “acche din”. Interestingly, the video was upoaded from the official YouTube channel of the party. The Bollywood star reached a milestone with 5 million followers on Twitter and wanted to thank them. Her debut was a sweet and simple thank you that garnered warm response on twitter. “Just realised Ive reached d 5 million mark.So here’s a msg 4 y’all sharing my life here wid me & makin it special ????? ?” she tweeted. Virat Kohli, the star sportsman and heartthrob of millions, made his debut dubsmash with his friend Sandeep Raj mimicking the scene of Bollywood movie ‘Hera Pheri’. The video went viral as soon as it was uploaded, which wasn’t surprising given the fact that it was Virat Kohli. Akshay Kumar dubsmashed for the first time with his then co-star Sidharth Malhotra mimicking Gaurav Gera’s “chhutki”. Chhutki ‘herself’ is a social media star and Akshay Kumar dubsmashing her was cherry on the cake. 3 British woman fled ISIS because it wasn't her "cup of tea"